Not quite there yet. 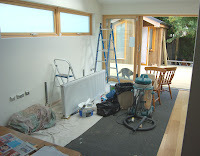 We really thought we'd be done by now, but the carpentry work for the doors and skirtings is taking longer than we thought. Stephen has got the doors up, but the kitchen door we're not allowed to open yet - I'm not sure why. I think it's something to do with the foam that's used to fix it in place? Although, now that I think of it, I don't think he used foam for that one. He's got the architraves (that's the door surround bit) up for the other doors and they are looking good. He's also got most of the wood cut to size for the skirting boards, and has started fixing some of them to the walls. I'd say there is another 2 days' work to finish that. He is very meticulous, measuring everything carefully. It is slow work. You should have seen him carry the door frames around - he was like a ballet dancer, so careful not to knock anything! 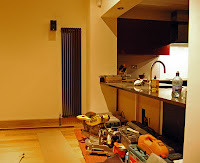 And the radiators arrived on Friday morning and were set up when we got back from visiting Paul on Friday evening. We're glad we were not there, as we would have been fretting about knocks to the floors and grubby fingers on the walls. Kevin was there to supervise the whole thing and it went well, without any damage to the floor. We wanted Kevin to watch the plumbers closely, as they had left some scratches on the tiles in the en-suite bathroom when they put in the sink and loo after the tiling. It looked really bad at first, but it now appears that it was porcelain marks over the tiles, rather than a scratch in the tiles themselves. Kevin managed to clean it up pretty well. Not 100%, but we'll live with it, I think. 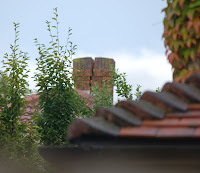 Building an extension, you learn the art of compromise. Margaret had advised us to protect the wooden floors, and we did, but we're only sorry we didn't have full cover for every inch of it. Any bit that wasn't covered got a scratch of some sort, whether it was from the painter's ladders, the kitchen units, the doors and carpentry tools or plumbers' toolboxes. It upset us a lot at first, but hopefully they won't be too noticeable when everything is finished. With time, I'm sure there'll be more scratches, but we just want everything to be perfect, if only for one day! Over time, we probably won't notice the imperfections, just enjoy the new space. It looks stunning with the kitchen units lit up at night, I have to say! Stan tidied everything up and even karchered the front drive. It almost sparkles! It certainly hadn't been this clean in 2 years, since we had last cleaned it! We're nearly nearly there! The thing is that we were not mentally prepared for it to take this long, as Kevin had told us at the start it would probably take less than the 14 weeks quoted for, closer to 10 weeks... We thought it might take 12 weeks maybe. The scope increased slightly, and we're now just over the 14 weeks, and we just want our house back! So, the lesson learned is not to be taken in by Kevin's optimism. Plan for 16 weeks, and be pleasantly surprised when it's done quicker. Not that we'll plan to ever do any more work to the house. This will do us for a lifetime! This is the frustrating bit - we're nearly done, but it's slow to finish. Ray the plumber finally came in today, and finished Brendan's bathroom, and managed to scratch some of our brand new tiles. Very annoying. And the worst thing is that he left without saying anything, so we only discovered it after he was gone. I'll be so glad to be rid of him - he has to come back again to set up the new radiators, whenever they are delivered. We had been told they would be delivered on Monday, but now apparently they are stuck on a boat from England that is being delayed by the weather. Mmm. Mmmm. It's raining all right, but the sea doesn't look that rough to me! Stephen the electrician, ever so reliable, tidy, and nice, on the other hand, rang this morning to tell us he would be in tomorrow around 9:30. If only the plumbers were a bit more like him! 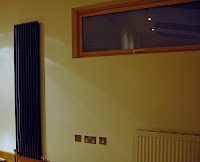 And Stephen the carpenter, such a lovely fellow, was in all day, setting up the doors and cutting the skirting boards. He's a very sunny personality, and he works very methodically. He does a great job, very neat and tidy. If only the plumbers were a bit more like him! Last night, I couldn't face the night in, looking at the dust and the mess everywhere, so we went out for a meal at the China Sichuan restaurant in Stillorgan, our last meal in that location. They are closing next Wednesday, we overheard Kevin tell a customer, and re-opening in their new restaurant the following Monday. We had a peep at the new restaurant last week. 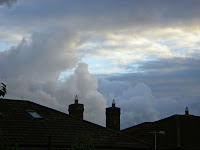 It's in Sandyford Industrial Estate, across from the Stillorgan Luas stop, in a quiet cul-de-sac at the foot of one the relatively new apartment blocks there, at the back of the big Microsoft building. It looks really nice, contemporary, understated and plush at the same time. I can't wait to try it out! BTW, I've written 540 posts to date - that's a bit scary, isn't it? If I was writing a book, it would be one of these big long sagas. Speaking of which, I'm reading A Suitable Boy, by Vikram Seth, for the 3rd time. It's just such a good book, I feel I will read it again and again. When I'm old and grey and I can't walk anymore, hopefully I'll still have the strength to hold that big heavy book and I'm sure it will bring me the same joy as it does today. Most of the electrical work is finished - only the uplighters in the decking need to be done, but the weather is bad again - after a dry morning, it's been bucketing down all afternoon, and the sky is so grey it looks like it will last forever. Really depressing weather, more like Belgium than Ireland! And Stephen the carpenter has started putting up the doors, after doing more work on the decking this morning while it was dry. He's got a couple more days' work to finish the doors and skirtings, I'd say. There was no explanation as to why he wasn't here yesterday. And Ray the plumber didn't turn up. David tried to contact him this morning but couldn't get through. Then Kevin apparently managed to talk to him and he promised he would be over "within the hour" - that was around 11 this morning (it's now nearly 6!). Somehow, we knew he would not turn up. It's really annoying - without him, Brendan's bathroom can't be completed and my front office still has a loo and a sink in it - not very practical! Its frustrating to be so close to having it all finished, and to be held up by a tradesman not turning up. No pictures today, the place looks too messy! Thank you, Mary, for the lovely banana bread! We're both enjoying it. E-Day + 82 - No More Leaks! The rain yesterday was torrential - there were flashfloods in a number of locations around the country, with thousands of people stuck on the M50 and other roads cut by the flooding. This was the perfect test for our roof, that Kevin and Stan had just worked on that morning, after we had discovered a leak at the bottom of the Velux window. Brendan had texted Kevin when we found the leak, but we were not expecting him to come and fix it until Monday. But that's the way Kevin is - he just does not want to let his customers down, and he is always ready to jump in the van and come to the rescue, with Stan in tow of course! Well, after the rain we had yesterday, the roof has passed the test, that's for sure, and we're not going to let anybody back on that roof to do anything more to it! Mark finished the painting work in our downstairs rooms yesterday. He did a test of the 2 paints for Brendan to see, and they are almost identical, one slightly darker than the other, but definitely not creamier or yellower. It's a highly reflective paint, and it's picking up the colour from the wooden floor a bit, hence the warmer effect. I'm very happy with it. It's lovely and bright this morning and the light is reflecting everywhere. And Kevin the tiler is here grouting the en-suite floor. This picture shows the devi mat laid under the tiling. It will all be in time for my sofa delivery from Ikea, due on the 19th. And we'll have the upstairs and outside to be painted, but that won't be until late September at the earliest I'd say. And our new table and chairs to be delivered, in about 8 weeks. We finally found what we were looking for yesterday, in Montana, just around the corner in Sandyford Industrial Estate. It was in the sale, so we've saved a bit of money too. Some pictures of Willow, who has taken to our new Dunnes Stores deck chairs! Busy day today. The place looks like a bomb hit it again, and I don't think we'll have the energy to clean up again at the weekend - plus there will be tradesmen here tomorrow, so there really is no point. Stephen did more work on the decking - amazing how much goes into a decking - I would never have thought. Kevin was over with Stan and tidied up a good few bits and pieces and made us feel good about things in general. Stan even hoovered the stairs! And they sorted out the hot air tube for my new dryer, which was delivered today. So our shed is now looking like a proper laundry room! Our doors were delivered. 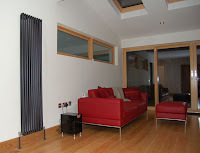 They are currently sitting in the extension, and will be installed on Monday, after the painter is finished. Mark the painter and his colleague are making great progress with the painting. They were able to start yesterday afternoon, with one coat of white throughout the kitchen. Today, they were in at 7 am, and did another coat over the 3 rooms downstairs. They used their own mix for the colour we had picked, based on a sample we gave them. Apparently, it's scanned into a machine and a mix is produced based on that, but it's not an exact match. Brendan is a bit disappointed - he finds it too creamy. I, on the other hand, think it's just perfect. I think Brendan was hoping for a more minimalist white look, whereas I prefer something slightly warmer. It's nearly 8 pm, and Kevin the tiler is still here, working on Brendan's bathroom, which will be done in the same style as mine - without the pink shower curtain, and with a devi mat - the equivalent of an electric blanket that goes under the tiling. I wasn't too gone on the idea of underfloor heating, so I opted out. If I change my mind, I can always take over Brendan's bathroom! No builders today - too much rain this morning. But then it brightened up beautifully this afternoon. Ah well! Despite the fact that it's lovely not to have builders around for a change, I'm a bit anxious to get them to finish some of the items (such as the leaky roof - but you need a dry day for that, and the decking - but you need a dry day for that too), as we have a painter starting on Friday (or Monday at the latest). Kevin promised they'll be over tomorrow, so I'm looking forward to the last bits and pieces to be done. Brendan and I wish you a very happy birthday! No builders today - too much rain. Bank Holiday Monday - no builders today. It's wonderful to have the house to ourselves, even for just a few days. The end is in sight, and we can't wait to be done. Yesterday, Brendan cooked his signature chilli con carne. This is a picture of the work in progress. Now I must go back to my boxes and get more kitchen things out and into my new presses. There are still a lot of boxes and bags up in the front bedroom. No builders today - the first Saturday in what feels like ages that we have the house to ourselves. Yesterday was another busy day. As we had to leave at 1 to go and see Brendan's Dad, a lot had to happen in the morning, and it being Friday, contractors didn't seem to turn up on time. But it all worked out in the end. My bathroom is finished, and is looking lovely (after a lot of cleaning up - I find that the young plumber in Ray's team isn't too clued in on keeping the place clean after himself). Brendan's bathroom has been started and is looking like a bomb hit it. By next weekend, it should look just like mine. We got good advice from David and Kevin about using the same tile as a skirting board and putting up a board with mosaic by the side of the bath (instead of the yellowed plastic element), and it's looking much better than the old lino. Detail of the tile (B&Q) and mosaic (Tubs and Tiles) and pink shower curtain (Dunnes Stores). We have the timer for the heat working, and one of the sockets above the cooking counter. The hob has been connected and is now operational - very snazzy. Stephen the electrician is a diligent worker - he just focuses on the job and is very neat. He got on great with Brendan, as he is also interested in music, and the 2 of them discussed all the music programs that they use on their computers. The extractor hood is sorted, thanks to Alan, the kitchen fitter. If you're ever looking for a kitchen fitter, I'd definitely recommend him. He is local, he turns up when he says he will, and does a very neat job. He had a tough time yesterday, adjusting the back panel with the granite to make it all appear straight. And the extractor hood required a bit of imagination in terms of getting it to go through the kitchen panel at the top. The illusion is perfect. There were a lot of tool boxes around yesterday, and, despite the mats, our floor got a bit of a bashing - a couple of knocks. We probably won't notice them after a few days, but it just shows that it's essential to protect a new wooden floor if you have builders and tradesmen around. Some of them are great (David always takes his shoes off), but some of them are just young men who don't pay much attention to such detail. Today, we have the house looking lovely. We have taken most of the mats up so we can enjoy the floor. Brendan assembled a few Ikea items, and got his stereo hooked up, and I have spent most of the day washing dishes, cleaning presses and filling up our kitchen units. And Brendan is cooking a roast and roast potatoes for dinner tonight- our first proper meal (well, our 2nd really, as we had chicken last week). And I even got to sit down on our decking for half an hour, enjoying a bit of sun. Next week: completion of the decking, tiling of Brendan's bathroom, finishing off of the electrics, including decking lights, and hopefully doors and skirtings (although I have a feeling the supplier won't have them ready on Tuesday). Not sure when the radiators will be delivered. I think it will be another couple of weeks, as there was a 6-8 week time on the delivery. And our painter will start the week after next. We got Mark Delaney in the end - he won't be able to do it all in one go, as he has other jobs he's committed to, but he'll do the downstairs rooms to start with. Did I tell you the other painter let us down? And we still need to find a new dining table. Another day's work! PS - we still have the plastic covers on our kitchen units. It's not coming off until the last of the tradesmen is gone!